Lianne was born in Dunedin and has lived in Oamaru for over 18 years, 10 of those spent farming. In 2007 the Dalziel family was awarded the CRT Century Farm Award for over 100 years of farm ownership. Lianne has a Bachelor of Education (Teaching) 0-8 years and a National Diploma in Business Level 5. Previously working in early childhood centres, lower primary school and for North Otago Plunket Society as a parent educator. Lianne has completed her Real Estate Salesperson Certificate in 2009 and has been working as her husband Merv’s personal assistant ever since, being a big part of Merv’s achievements in real estate including Top 10 Agents nationwide for the past 4 consecutive years and Oamaru Top Office in 2017 for their previous agency. Lianne has 2 daughters, 4 step children and 5 step grandchildren. 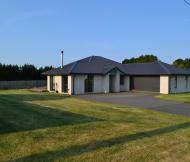 Merv and Liane have built two houses and developed a subdivision within the past 12 years. As a well-established husband and wife real estate team, Merv and Lianne pride themselves on guaranteeing good ongoing communication for all their clients.